Dimensions: approximately 6 1/2" by 90"
I'm thrilled with how this turned out. 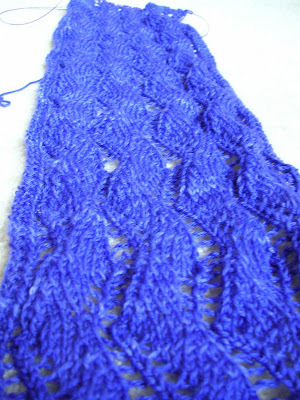 The lace repeat was easy to memorize after two or three repeats, and after that, the rest of the scarf prettty much flew off the needles. I reduced the stitch count in part because I was only using one skein of yarn, but also because this scarf struck me as more of an accessory than an article for warmth. I ended up with only a few yards leftover but a nice length. I did not block very aggressively, however, only just enough to open up the lace and straighten the edges a bit. 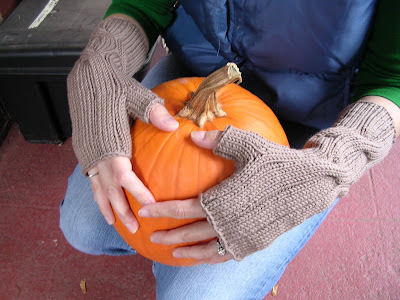 I'm really quite enamored of this pattern now and think I may eventually need to knit one for myself. 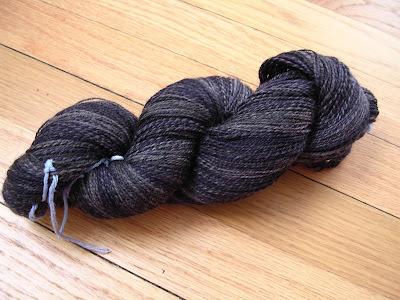 I think it might look very nice in my merino/alpaca handspun. I have a few more small things to knit, but now the majority of my holiday knitting is complete! Cross another holiday gift off the list. These were a quick, satisfying knit. 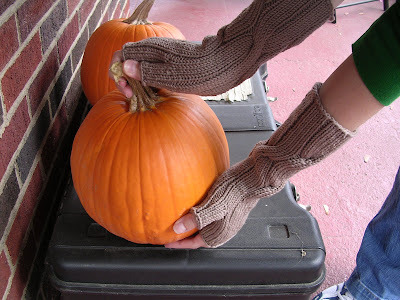 I had to wait until several days after they were completed to do a proper photo shoot, but they knit up in just a handful of evening knitting sessions. 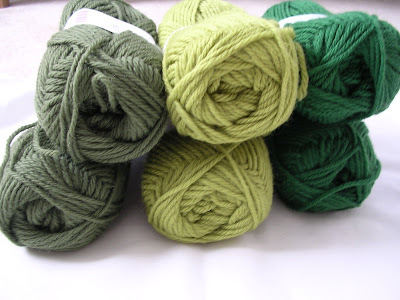 The yarn was a delight. It had been sitting in the stash for quite some time, waiting for the right project. When I asked The Mister for guidance on color choice for his mother, he suggested a neutral shade, so this Aurora 8 fit the bill perfectly. I omitted a few rows here and there in part because I was nervous about running out of yarn (probably wouldn't have been a problem in the end) but also because my mother-in-law has small-ish hands, like me, and I didn't want the mitts to be too long. I tried them on as I went, and as you can see, they're a perfect fit on me. The Mister says she'll love them, so I'm happy. Just a little steam blocking is left and they're ready to go. I finished some other holiday knitting this weekend, but you'll have to wait until at least tomorrow to see it; it's still drying. Trust me, it's worth it. I'm thrilled. 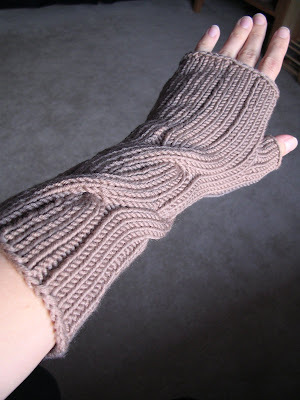 The first of the Dashing mitts is done, and I have to say that if I hadn't already planned these as a gift, I'd be very tempted to keep them. 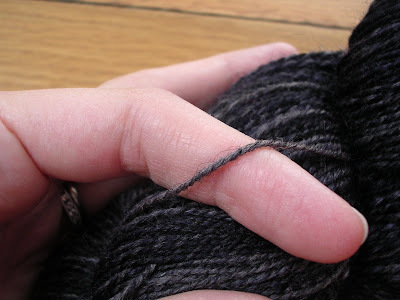 This yarn is so unbelievable squooshy! Now that the blanket is done, I'm through with all the non-holiday obligatory knitting and am turning my attention full time to "Chrismakkah" gifts. First is a Lace Ribbon Scarf for my mother in J Knits Superwash Me Sock, one of two skeins I picked up at 30% off at Natural Stitches. 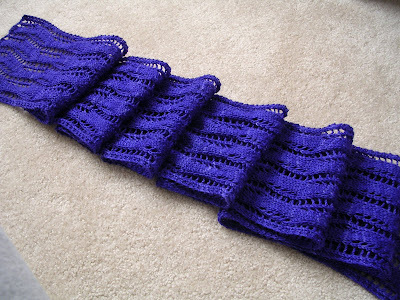 It's knitting up very quickly, and I have to say that this is one scarf that I've actually found fun to knit. 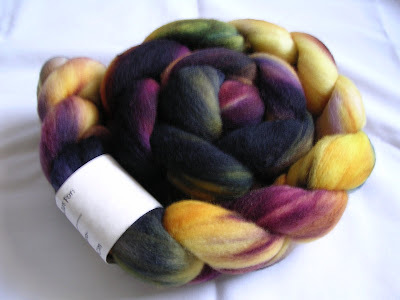 Eventually I think I might knit myself one, maybe in my merino/alpaca handspun. It's amazing how hard this color is to capture on camera, probably because it looks different depending on the light. 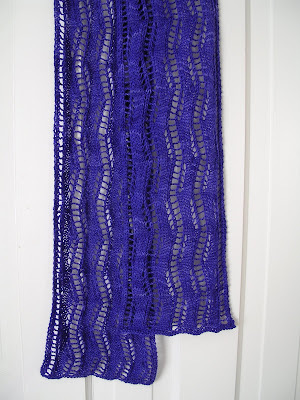 It can go from a deep royal blue, as it appears here, to a really vibrant purple. It looked purple through the lens as I took this picture, but you can see how blue it turned out. Tonight I'm casting on for a pair of Dashing (Dashings?) for my mother-in-law. I'm using some very old stash yarn -- Karabella Aurora 8. I bought it at Pittsburgh Knit & Bead when it was closing; I don't remember exactly how long ago that was, but I know it was when I was still living in my apartment and just starting to build a stash. 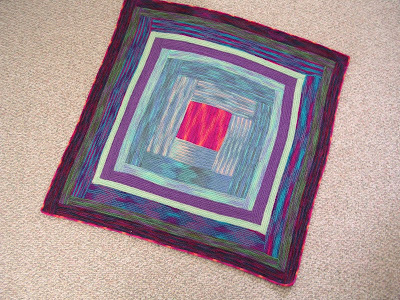 It's so old I never even catalogued it on Ravelry! 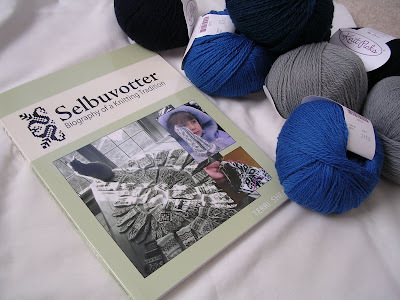 Fortunately it's still in pristine condition and will make some nice squishy mitts. 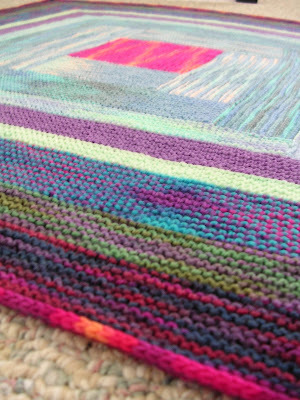 Miles of garter stitch, a seemingly never-ending edging, and two days to dry, but the blanket is done. 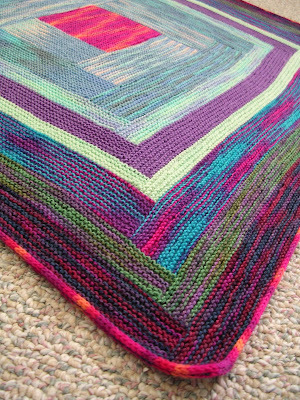 Dimensions: approximately 27" x 27"
I knit this blanket after a request from Amelia's mother, a coworker of mine. Amelia has a very rare condition having to do with her liver. Because of her condition, she is likely to wind up in the hospital from time to time and may even require a liver transplant one day. In her six months of life, she's already had one surgery and spent time in the NICU. Her mother lamented the fact that she looked so small and cold in the hospital, and at that moment I knew a wool blanket was in order. I decided to use sock yarn because I knew it would be perfect for a blanket that would be warm but not too heavy. It also needed to be in a superwash yarn so it could be cleaned easily. I chose the Shepherd Sock mostly because I had a lot of scraps left as well as a lone skein of one color; Jen very generously donated two skeins she had that became the two outer stripes. I purposefully kept the size of the blanket small. It will be just enough to cover Amelia now, and my hope is that, as she gets older, it will be more of a comfort object than a covering. I'm really pleased with how this turned out, and I'm hoping that all the positive thoughts I put into it as I was knitting provide some comfort to Millie and her parents. There's not much commentary I can give on this sweater; like all EZ designs, it's simple and straightforward and results in a completely wearable garment. I stuck with a simple 2x2 rib for the hem, cuffs, and collar and blocked firmly so that they wouldn't hug the body too tightly. 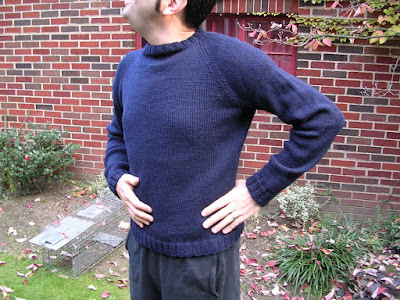 My father in particular is not fond of collars that are too close to the neck -- he used to talk about the sweaters my aunt made him years ago, sweaters that had collars so tight that he couldn't get them past his ears when he tried to put them on! -- so I made a real effort to keep the collar loose. It's maybe a little too loose, but I preferred to err on that side than risk it being too tight. 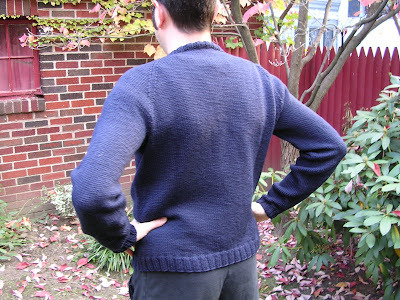 The Mister especially liked the raglan shaping, so he'll likely be getting one of these in the future. 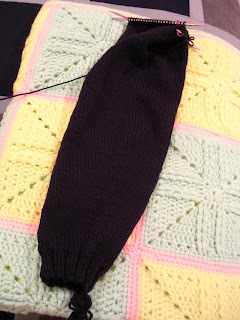 I happen to like the look of the Seamless Hybrid a little better, but this is a lot less finicky to knit. With a little shaping, I think this would do very nicely as a woman's sweater, too; it certainly doesn't have the look of football player shoulder pads that saddle shoulder sweaters can create. 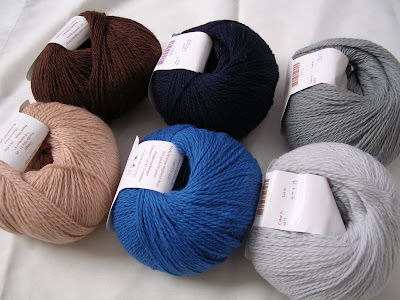 *One note on the yarn usage: I had to break into my sixth skein of yarn to finish the collar, but after I wove in my beginning ends and snipped off the tails, I think the excess was probably equal to the amount I used in that last skein. I spit spliced every time I joined a new skein, so I really maximized my yarn use. Plus, did I mention that my dad kind of has long arms? 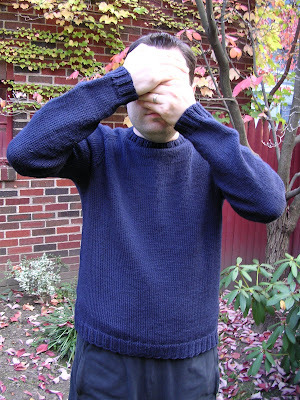 Those extra couple of inches on each sleeve would certainly be enough to finish a sweater for a similarly sized man, such as my husband. Tonight we're playing a game. It's called "Who Had the Most Productive Weekend?" Let's compare the stats. The Mister? 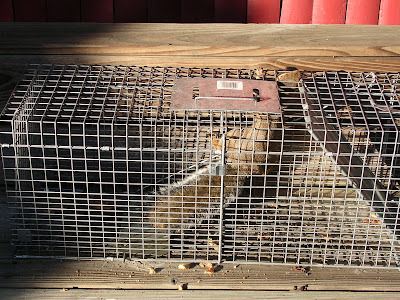 Well, he caught a squirrel. Two of them, actually. This is only the first one. He also released both of them. I think he might have a future in pest control if he keeps this up. Of course, what we did is nothing compared to Jen, who gave birth to twins Saturday morning! I think it would be really great if, once she's home and back online, she opened her e-mail to a bunch of congratulatory messages. So why not pop over to her blog and leave her a comment? I'm sure she'll appreciate it. Thanks! I bet you thought I'd fallen of the face of the earth, didn't you? I didn't, but it has been a crazy week. I have a fiber-heavy post ahead to make up for my absence, though. I had a lovely surprise waiting for me at home yesterday evening: Both my Knit Picks order and my All Spun Up over had arrived! I was really shocked at how quickly the former got to me; according to the tracking, the box spent only 32 minutes in Leetsdale. I gotta say, I'm a little disappointed in the yarn fans at the distribution center. They're really starting to let go of my yarn more easily. But enough about the postal service. I know you want to see what I got. Let's start with the fiber, shall we? This is 100% merino, and the colors really make me think of fall. I'm going for a three ply with this, using my fast flyer again. Palette in Twig and Bark (browns), Blue and Navy (blues), and Mist and Fog (grays). The Blue, Navy, and Fog are new. What do you think? I also got some Wool of the Andes in Fern, Avocado, and Grass (left to right) for the felted Christmas trees from the new Mason-Dixon book. I think it will be good for ways to use all the extra Palette I have sitting around, don't you? Finally, take a guess what I finished last night! It's in its bath right and will need to dry, so expect some finished shots in a day or two. Thanks to some very diligent knitting time (and two rather interesting movies to watch), I managed to finish the second sleeve of my father's sweater and join it, the other sleeve, and the body on one needle. After some very long plain rounds, I've now started into the raglan decrease rounds. I think it's very reasonable to think I can finish this up by the end of the weekend, don't you? As to the title of this post, if it didn't make you laugh, then you obviously haven't seen this. Watch it -- you'll enjoy it, I promise. After days of waiting, this morning the sun finally came out and stayed out for an extended period of time. 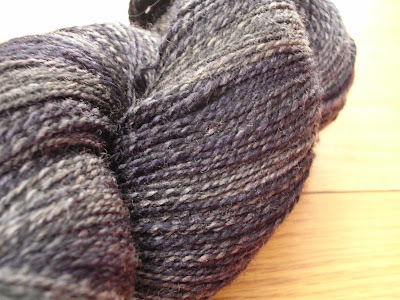 So, I immediately grabbed my camera and my latest handspun for its photo shoot. I'm quite happy with how this yarn turned out. I split the fiber into halves to get a random color effect. 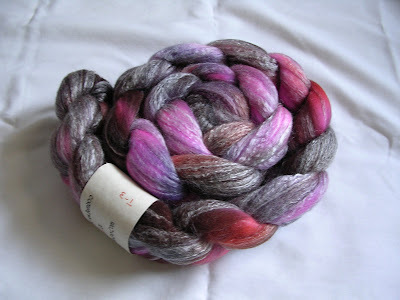 I also used my fast flyer for the first time on this yarn, although I used the standard flyer to ply. 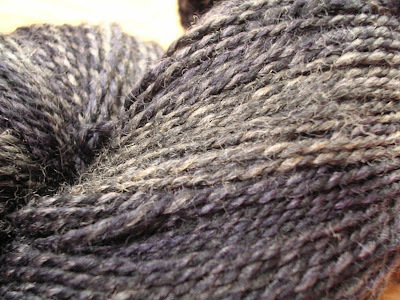 The fiber, if you recall, was shades of gray with the slightest hint of purple. That, combined with the alpaca content of the fiber, gives a delightfully tweedy look to the finished yarn that I just love. See that pretty halo? This will look so nice as something lacy, though what I haven't decided just yet. *The Mister's suggestion for the title of this post. I said it last night and I'll say it again: My father has monkey arms. Here's the first sleeve of my father's sweater, currently measuring up to 18 inches. And I still have two more inches left to knit. Yup, monkey arms. 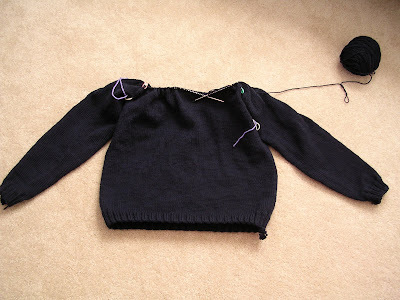 Fortunately, the sleeves are a pretty quick knit, especially in comparison to the body. About half of this sleeve was completed last night at Hurricane Knitting and I should be able to finish up those last couple inches while watching the debate tonight. We had a small group last night, but I was glad for the good company. I was also not pressured at all into making a purchase. I'm excited about this book. I'm thinking that the felted Christmas trees might be a good alternative to coming up with another idea for an ornament. We're supposedly doing a "green Christmas" this year with our friends (you remember, right? our friends who have their Jewish friends over for Christmas every year? 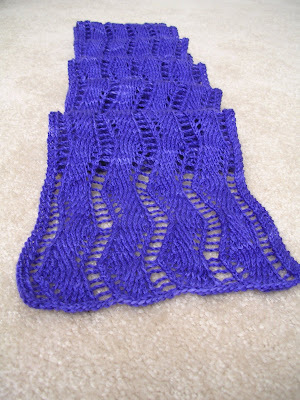 ), so I'm planning a bunch of knit dishcloths, Swiffer covers, etc. as gifts. I don't know about you, but I'm really looking forward to this weekend. We have plans to get together with some friends Saturday night, but other than that, our schedule is free. 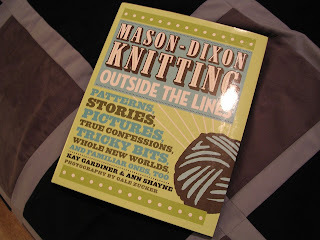 I'm hoping to get in a lot of knitting time and maybe see some fireworks. What do you have planned?